Inspired by the recipe for Golden Potato Leek soup I found on Food52, I cut the recipe down and added some cream (because who doesn’t love cream?). Slice leeks crosswise across the stem. Cut fingerling potatoes into quarters. In large pot, melt butter. Add sliced leeks and salt and cook on medium until transparent, stirring frequently. 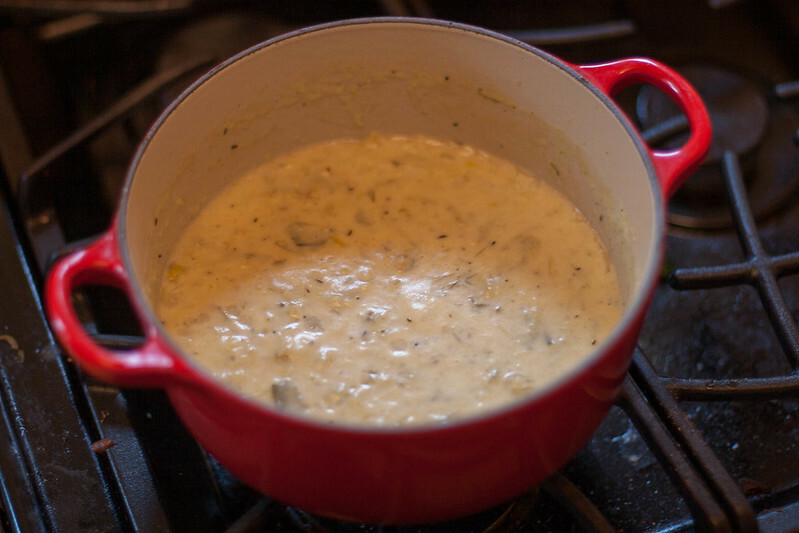 Add water, cream, potatoes, and thyme to pot and increase heat to bring to a soft boil. Cover and simmer for roughly half an hour, or until potatoes are soft and break easily with a fork. Puree the soup using an immersion blender (or regular blender if you don’t have one). You can blend as much or as little as you’d like. It can be whatever consistency you’d like! Serve immediately, or rest soup on low until ready to serve. I would recommend serving the soup within a week, but if you want to freeze it, you’ll likely need to blend it again after warming it up.